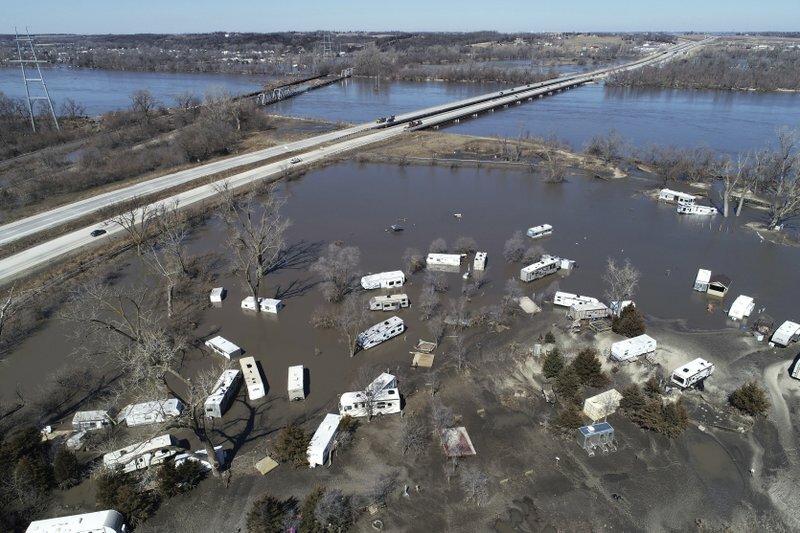 Major flooding now occurring in Nebraska, Iowa, South Dakota, Missouri and other Midwestern states is a preview of an all-too-wet and dangerous spring, said Mary Erickson, deputy director of the National Weather Service. “In fact, we expect the flooding to get worse and more widespread,” she said. This year’s flooding “could be worse than anything we’ve seen in recent years, even worse than the historic floods of 1993 and 2011 ,” she said. Those floods caused billions of dollars in damage, and officials said this year’s damage in Nebraska, Iowa and South Dakota has already passed the billion-dollar mark. Extra rain will bring more farm runoff down the Mississippi, which will likely lead to more oxygen-starved areas in the Gulf of Mexico and likely make the summer dead zone larger than normal, said Edward Clark, director of NOAA’s National Water Center in Tuscaloosa, Alabama. It’s too early for scientists to make the complex calculations to see if human-caused climate change played a role in the flooding. However, scientists said the conditions are consistent with what they expect from global warming. “You can think of climate change as steroids for these rain events,” he said. University of Illinois climate scientist Donald Wuebbles, co-author of a report released Thursday on climate change and the Great Lakes, said “we have been seeing a significant increase in precipitation coming as larger events, especially in the Midwest and Northeast, over the last five to six decades.” It will get worse, so flooding will get to be a bigger concern, he said. One Mississippi region protected by levees is also flooding. The smaller rivers there can’t drain into the Mississippi River as normal, because a floodgate that protects the region from even worse flooding by the big river has been closed since Feb. 15.